When I was a student in Manchester Yeshiva, I read through Lekutei Diburim and didn’t understand how it was possible that no one was teaching us how to Daven properly. I asked someone about it and they told me I have to go to Morristown to ask Reb Meilech. So I went to learn in Morristown. 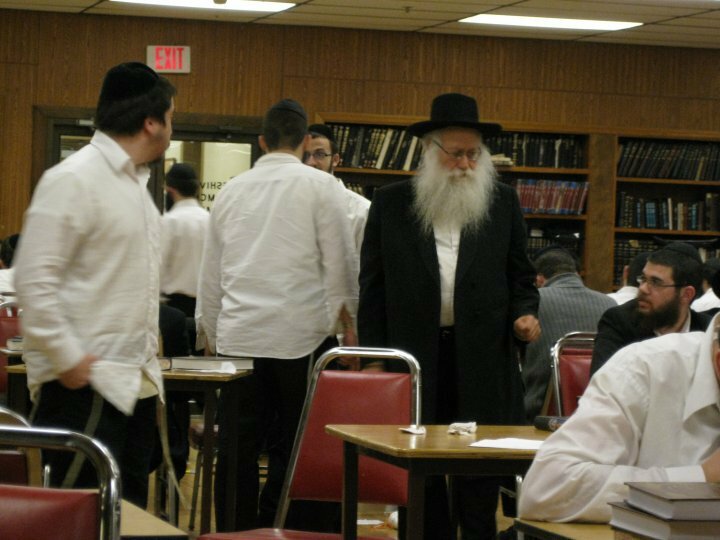 I wasn’t officially in Reb Meilech’s class, so I wasn’t sure if I should even speak to him or not – I was way too scared to speak to him. Finally after Tishrei I gathered the courage to go ask him if he could teach me how to daven, and that was the beginning of the most productive two years of my life. They say the only reason he was greater in nigla than in chassidus, was simply because there are more seforim on nigla. He had another greatness – when a student spoke with him, he cared as if they were the most important thing in that moment. I had the zechus to bring him breakfast and sometimes lunch or supper for over a year, and kept a key to his office. Towards the end of my time in Morristown, we used to learn and talk every day in his office for around 30 minutes. During the winter shabbosim, he would host farbrengens in his home – a modest bungalow in a forest clearing. One week I didn’t get the memo that he was not hosting a farbrengen that week, and innocently came and knocked on his door. He invited me in and he farbrenged for an hour or two. I once asked him something about doing teshuva, before giving his suggestions he smiled, gave a slight chuckle and said, “Teshuva? We’re all balei teshuva, even I’m a bal teshuva,” pointing to himself. He once told me how he finds it really difficult to relate to people outside the yeshiva world. He told me he went to his son (or son-in-law’s) Chabad House and spoke with the people there, but couldn’t understand most of what they were talking about. He said he has so much awe of the shluchim, because they could connect with everyone. The first thing he ever told me about davening was this: davening is not just when you’re in shul, davening is an avoda throughout the whole day. Everything you do is a preparation for davening. The very first thing to work on, is to create a habit of doing things as soon as they need to be done. Including mundane things like laundry. Never push anything off. Do it as soon as you can. This, he told me, is the key to avoda. Red Meilech was very into seder. Everything has to be planned in advance. You have to know what you will be doing at every minute of the day. You don’t want to be in a situation where you may turn to your impulse in order to decide what to do next. So I had set times to think about certain things. I knew a Perek of Tanya Ba’al Peh, and he told me to make sure to say it twice a day – which would be as I came upstairs from the lunch room after breakfast, and after supper. He also told me to spend five minutes every day learning Tanya by heart, as well as to go over Igeres Hateshuva periodically. How you go to sleep is how you wake up the next day: He told me to take my time saying Shema before going to sleep every night. It used to take me around 15 minutes to think about my past day (everything in order, of course), and what I can improve in the next day. Then he told me to learn Perek Beis of Kuntreis Haavoda, and go over it every so often. After that he told me to learn Kuntreis Hatfila, starting from Perek Yud-Alef until the end, and if I had any questions to ask him. After that, he said I should go back to the beginning and start from Perek Alef – this ideally should be done every month. He told me to work on saying and pronouncing all the words properly, davening loud enough that I can hear myself with my ears. Then, I should learn all the basic meaning of the words. When I told him I didn’t understand the meaning of the words in davening – or rather why it talks about some things and not other things, he told me to learn Rashi and other mefarshim on the parts of davening that come from Tehillim. He said that when davening, I should try to relate to the words as much as i can, i.e., realise that I’m actually speaking to Someone. He said to start with learning the meaning of Ahavas Olam, and then, right before saying it, to pause and think about one thing I could improve on and make a hachlata to do better, and only then continue on to say Shema. Another bit of advice, was to always try to daven with a tune. Even to sometimes pause and sing a niggun while thinking over chassidus or the meaning of the words. Before davening (before Hodu), he told me to always think over chassidus in a systematic way. Meaning, each week to take a new Perek of Tanya and read it before davening, then close the sefer and try to think through it, in order, with as many details as I can remember – everything the Perek said. Every day the same Perek for a week, then a new Perek the next week. To start, he said to just sit and think about the Perek for 5 minutes, then 6 minutes, then 7, etc, and slowly build up. The idea, Reb Meilich explained, is to have a very controlled and methodical thought process, and be in full control of your thoughts before you start to Daven. This is achieved by thinking through a Maamar or Perek of Tanya, in the correct order, understanding how everything is connected, and how this Maamer relates to you. If you don’t understand something or come up with a question, put it aside and keep going – this is not a time to think up chidushim or to ask questions, it’s a time to think in a very systematic and orderly way. This way, when you go into davening, your mind is already on track. He instructed to minimise any activity in between learning chassidus and actually starting to daven, so if I wanted to drink or eat something, or especially to go to mikveh, it (ideally) had to be done before chassidus. During the week he said I should take one part of davening and focus on that for a while, take my time saying it and rotate to another paragraph over a few weeks. But on Shabbos, he said to start Hodu with the minyan and daven slowly, thinking about the words and how the chassidus I learned before davening connects to it, or the simple meanings up until the Baruch Sheamar. By that time the chazan would usually be holding at chazaras hashatz. Reb Meilich instructed to wait there, and answer kedusha with the minyan, as well as listen to davening and kadish until the end of davening. Then after the last kaddish, I’d go to a side room and finish davening slowly. שהצלחת לתאר את הדוד שלי בצורה כל-כך מוצלחת. אני רק מקנא בך שנשאלת להוציא ממנו את מה שאני לא קבלתי. Beautifully written wisdom, which is definitely worth sharing. Thank you for putting it out for others to enjoy and benefit from this giant of giants. Just one request: if you have more to share from what you gleaned from R’ Meilach, please don’t withhold. Which only begs for any other gems you gleaned. So what time do you finish davening on Shabbos, if you only reach Baruch Sheamar when the minyan is finished? Thanks for sharing this – it’s so relevant! I learned in Morristown in the Tuf Shin Lamed’s and drove his kids back and forth to cheder. There had been a well next to his house and we used to draw mayim shelanu for matzo baking every year. I remember a particular conversation I had with him once. I hope to meet you at the Chol HaMoed picnic. This is a beautiful article that I’ve read a few times now. I learned in Tiferes, the floor below, and saw R’ Zweibel around a little. The little I saw was great and after reading articles like this I wish that I had found a way to be around more.